Big beautiful eyes, large bushy tail and striking dark legs, all professionally lit with my truck’s headlights. It is almost discouraging this photo appears reasonable … despite the terrible filter. How could this happen? I admit to spending some money getting quality lenses. A huge factor with each purchase was trying to figure out which lens would provide a sharp image. After I buy a lens, I meticulously keep it clean, so dust or smudges don’t take anything away from the final digital image. I have even taken the advice of wildlife photography gurus and removed the protective UV lens from all my lenses because another layer of glass could potentially remove some sharpness. I figure if the lens is heading for the drink, the UV filter won’t save it. No I am not trying to bore you with my quirky photography habits – that’s just a bonus. Context is important for what happened next. 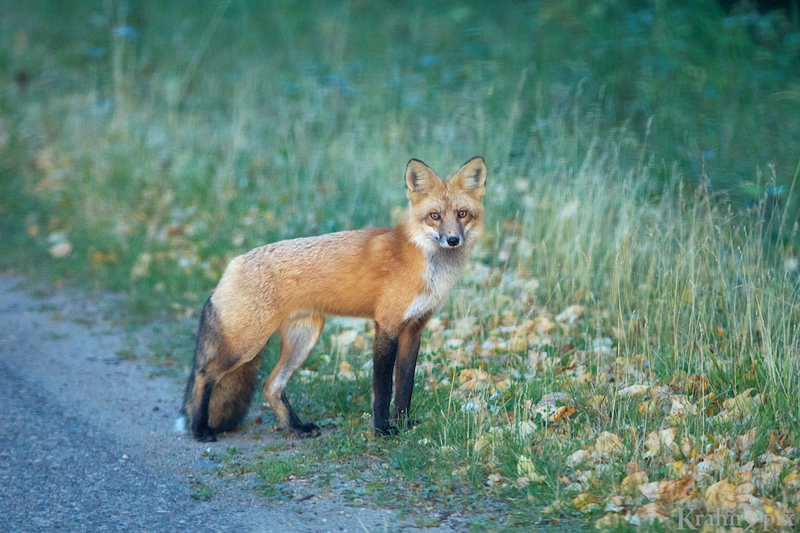 I was driving around a national park and suddenly a fox appeared directly in front of me at the edge of the road. I slowed down and grabbed my camera at the same time. The fox was caught in the proverbial headlights, looking straight at me. More likely it was getting blinded by the lights! This is where I could wax poetic about the symbolism of the fox travelling down a different road. Or I could tell the truth and say I took a quick photo after the fox left. I had to make a quick decision. It was high risk to take a few seconds to lower the side window and stick my head out to take a photo. So many times wildlife will stop and take a quick look before turning away and disappearing into the bush. I didn’t have time to open the window. So I cringed and did the unthinkable – took the photo through the windshield. I can’t begin to imagine all the glass imperfections, bug guts and dirt specks that I was looking through. So much for high quality when the windshield is my defacto filter! Combine that with the effect of the low light and it was quite easy to lower my expectations of image quality. When I got home and looked at the photo, I was surprised. The photo was reasonable, maybe even blog worthy. Then I began to wonder whether I could have saved some money and some time cleaning. For a second there I was almost disappointed the photo turned out so well, but it quickly passed. I love this fox and I’ll keep my lenses. Of course it wouldn’t surprise me if I have perfect conditions and a clean lens next time and get a worse photo! Photography can be full of surprises. Why thank you. The photo did turn out well despite being taken through the windshield. My surprise at the result prompted the blog. And I’m glad you enjoyed my humour. I appreciate the comment. I love foxes and this is a wonderful image Lyle. They are wonderful creatures – I was happy to get this one. You have a great day too. I read your whole post to see why your thought this was a bad photo. Only it isn’t. And you didn’t think so either. Why did you make me do that? 😉 Love the shot of his big bushy tail too. I must confess to enjoy teasing people – perhaps a little too much. It truly is a wonder people keep coming back! Glad you liked the shot. It was a beautiful fox. That first shot turned out well, personally I’ve never shot though my windshield before but if you had not you would not have got the shot … and a fine shot indeed. I think it was my first time trying to get a shot through the window so that added to my surprise. I keep learning to keep shooting and the surprises keep coming – some of them good ones. I appreciate the comment. Well that was unexpected!! I was all ready for what was that terrible filter!! The image does have a lovely muted color scheme..window or just time of day or headlights…pleasant tones and wonderful expression on the part of the fox!! Pretty really!! I’m glad I’m not entirely predictable – that would be boring. Your observation about the colour scheme is exactly right. I think it might be hard to replicate that with all the factors you mentioned. I guess that’s why I keep taking photos. Glad you liked it. Those are beautiful fox photos, Lyle. Quite healthy looking. Some tail! I was fortunate to find such a beautiful specimen with a gorgeous tail. Foxes are quite special to me. Glad you liked the photos. I seen fewer here than back east, but there are more open spaces here for them to hide. Several years ago, I did hear a strange yipping bark one night near the back of the old house about 3 AM. A small greyish colored fox was sitting on our back steps, commenting into the night! I watched for a little while, until he became aware of me watching out the window and moved on. Just imagine the studio photographers that not only already spent a ton of cash on quality cameras and lenses as you have, but also invested significant amounts in lighting as well. Truck headlights are clearly where it’s at! I’d hate to be the one to tell them! The funny thing is that this past weekend we ended up using the headlights to light a bison in near darkness. The results were nearly so good so it might need a light fine tuning. Sounds like your windshield is much cleaner – and less covered in bug guts – than mine. I wouldn’t dare shoot through the glass after our most recent road trip! Love the photo. Glad you liked the photo. It was taken in fall so maybe there were fewer bugs that day. We were driving this past weekend and needed a major windshield clean every few hours so that sounds similar to you. I think I’ll still keep using an open window as my primary option for the future. Great tip. I’ll plan on riding with the windows down next time we venture through YNP. Thanks for the reply! I love reading your articles. They always make me chuckle, and I appreciate people who can write with a bit of humor. And I appreciate the people who enjoy my humour. That is one beautiful fox! A story wonderfully told in Krahn-esque style.Question…why no glare in the eyes?. I’m glad you enjoyed the post and I’m happy to hear that I have a style. Now that you mention it, I would have expected glare in the eyes. Another confusing part of this tale. More questions than answers on this post! I stopped using UV filters on my lenses as well for the same reason. Can’t really say for sure that my images are any sharper though as I never did any side-by-side tests. I’m happy to hear there’s someone else – I was getting lonely. I haven’t done a test either and I’m probably scared to after the windshield episode. There always seems to be an x factor that makes these logical decisions confusing. I’m pleased you enjoyed the story. That would be an interesting concept but I can’t imagine the price. Maybe they need to have a windshield that drops down or slides away with the push of a button. That would give the sales folks something to talk about! I’ve never tested the image quality difference but the theory makes sense (until the windshield episode). It also makes sense to avoid the scratches. Once the decision was made (with some pause) I just went with it and so far so good. The other unmentioned truth is that I hate buying them and it adds yet more glass to clean which is one of my least favourite things about photography. Glad you found the humour in the post. Shooting though the car’s front window is something I do often, especially with hawks. I make sure and get an image first. When I get out, they almost always fly away. Your fox photos were certainly worth getting and turned out great. I would have liked your poetic story about the fox traveling the lonely road. I might just try the windshield again (and it will probably be a disaster with the bugs around here). Getting an image first is a good strategy since an empty card is no fun. I have found hawks to be unpredictable creatures. Sometimes they are easily spooked and other times much more comfortable. It’s hard to guess. I may just have to follow up the poetic story some day. I had run out of gas when I thot of that at the last minute. Many years ago I was with a professional photographer and was surprised at the number of shots he took to get one good one. I decided if he needed that many, who was I trying to kid taking one shot and expecting it to turn out. So I try to figure it all out and then fire away. I really like the pleasant surprises when a shot turns out despite all previous experience showing that it won’t work. The surprises keep it interesting and part of the reason I keep going back despite the regular misses. Glad you enjoyed the photos and the post. Sometimes all the spots are in the right places. Luck was with you….or the windshield was much cleaner than you thought. Either way, I’d be pleased. Just about the time I seem to know something for sure – I get a result like this. Sometimes it’s better just to take it than try to figure it out. Sometimes you just have to give it a shot and you never know what happens. Excellent lesson, If that is the only way at least try, it could work. I would thot that by now I would stop getting surprised by results but it still keeps happening. It’s nice when the surprises are good ones. So I shoot first and finesse later.